Anyone who appears before Judge Dan Finello can be assured of fair and impartial treatment. He is tough on crime, working diligently with police and prosecutors to keep criminals off the street. But he is willing to give juveniles who make a first-time mistake a second chance. With guidance, many of these young people are kept on the right track. Judge Finello takes to heart the words "tough but fair." Judge Dan Finello is a vital member of our community, having lived in Warminster for over 40 years. He is the Head Varsity Coach of the Archbishop Wood High School Girls Soccer team. He is the twice Past President and a current executive board member of the Warminster Rotary Club. Judge Finello was twice named Rotarian of the Year. He was the Chairman of the Warminster Tricentennial Celebration in 2011 and has been active in many athletic, community, and professional organizations over the years. In 2015, Judge Finello was inducted in the Archbishop Wood High School Hall of Fame and the recipient of the inaugural Viking Award. Judge Dan Finello is experienced. He has been serving our neighbors as Magisterial District Judge since 2003. He has presided over thousands of cases, both criminal and civil. His court is run efficiently and effectively with no burden to our taxpayers. Judge Finello has completed all current updates as required by the Minor Judiciary Education Board. He is a member of the Special Court Judges Association of Pennsylvania. He is Vice Chairman of their Crimes Code committee and also serves on their Budget committee. 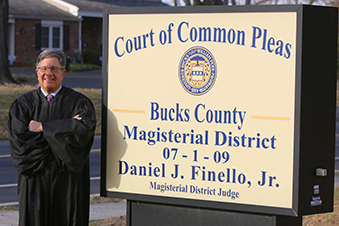 Judge Finello is a past President of the Bucks County and Montgomery County District Judges Association, currently serving as their Director.